Farmington, Maine originally belonged to the Cannabis Abenaki Indians, who cleared the land around Farmington Falls for the harvesting of corn and potatoes, as well as two campsites. The first white men to begin settling this area arrived in 1781, and immediately built Farmington’s first sawmill. Although it was called Sandy River Plantation in its early days, Farmington was officially incorporated as a town thirteen years later and named for its high quality soil. The primary crops included hay, apples and other fruits. Sheep herds were a common sight here, and Farmington was once one of the largest wool producing communities in New England. 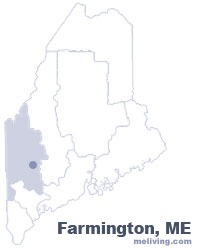 Today, Farmington is the county seat for Franklin County, and is home to the annual Farmington Fair, the Ski Museum of Maine and the University of Maine at Farmington. Historical attractions include the Red Schoolhouse Museum, Center Church, the Hiram Ramsdell House and the Titcomb House. Famous natives of Farmington include author Elizabeth Chase Allen, composer Supply Belcher, inventor Chester Greenwood, and Olympic snowboarder Seth Wescott. To share any Farmington, Maine information with us, please contact us. Learn more about advertising in MELiving.